In advance of the new year celebration there were two contests I decided to enter: RAC Winter Contest and Stew Perry Top Band Challenge. The first was partly obligatory to contribute to the Canadian presence for the event, but also to exercise the new antennas. This was the first contest I've operated with the full complement of antennas I put up during the year. For Stew Perry my interest was different. As an experiment I entered as QRP to see just how well my 160 meter antenna would perform against others under similar conditions. Although designed and built as a temporary solution it does do pretty well, putting me well on the way to top band DXCC and contributing nicely to contest totals. So I resurrected my KX3 and plopped it front and centre on the operating desk. It looks a little out of place next to the FTdx5000 and other equipment! The KX3 has been boxed up since before the move in 2016 and this seemed a good opportunity to get use out of it. Power on the FTdx5000 only dials down to 10 watts, which makes it unsuitable for QRP. I set it up the day before the RAC contest to get it integrated with the PC, keyer and antenna switch. Memory is a tricky thing so I had to take 15 minutes to familiarize myself with the controls once again. I had to think for a few moments to recall which buttons to press to turn it on. I took the opportunity to update the firmware which has gone through several releases since 2016. In comparison to some other transceivers Elecraft makes the process absolutely painless. My activity in Stew Perry was limited, by intent. This was an experiment rather than a serious contest entry. 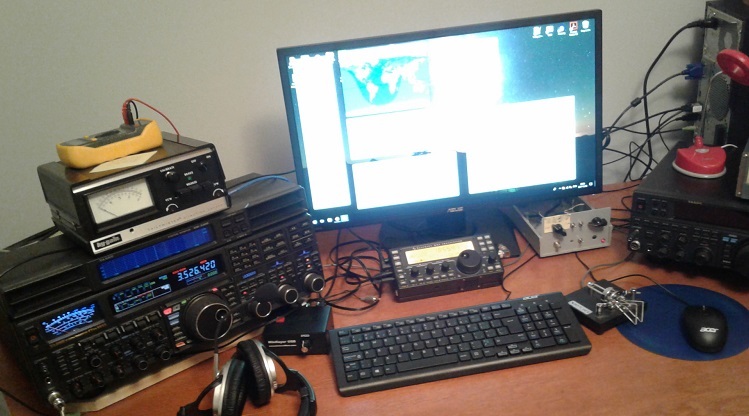 After the RAC contest ended and the evening meal I moved a few cables and fired up the KX3 on 160. Operating time as ~5 hours total, 4+ during the evening and then a little more in the hour before dawn. I wrote a lengthy soapbox comment for 3830 score submission, if you want to read it. For the blog I'll keep it brief. The antenna worked very well with only 5 watts. I didn't work a lot of DX, yet that I did work DX put a smile on my face. My furthest contacts were PJ2T, S5, HG and SP. I got a partial copy from a Russian station that would have been a real coup had we been able to make the contact. Looking at the incoming reports I can see that my performance was on a par with the best results of QRP entrants from this part of North America. That's useful feedback. Now that I know what this simple wire antenna can do, it becomes a baseline from which to plan a permanent antenna for 160 meters. What I also learned (or relearned) is that the KX3 is not up to the challenge of a band full of exceptionally strong signals. Operating was frustrating at times. Receive filtering is terribly inferior to any competitive base station transceiver. The critical issues were filter skirts at the narrowest settings and opposite side band bleed through (single signal reception). On the plus side the audio coming out of the headphones was an absolute pleasure to hear. Despite the negative notes the KX3 is a fantastic little rig. It is perhaps unfair to compare it to its bigger cousins. On the hand I firmly believe that every comparison should be against the very best available, no matter the price or size. I still like and I am keeping it. Should my interest in occasional QRP operating wane I will revisit this. Elecraft sells companion products to increase power to 100 watts and make it more of a base station rig. I don't see the point; better to buy a high performance base station rig if that's what you want. With these contests 2017 is in the rear view mirror and my thoughts turn to 2018. Ideas and plans are slated for articles later this month. Tnx QSO this evening on 20m Ron: your sig is fine and your CW excellent after such a long time off the air. Welcome home! I was licensed as G4iFB back in 1979 and have remained QRV most of my life in some form or other - mostly HF CW DXin. Having emigrated to ZL in 2005, we have found a nice radio spot, a hilltop forest clearing with no neighbors for about 2km, and they are out of sight down in the valleys/gullies ... so all the switchmode QRM is self-inflicted! Interesting to hear your comments on the KX3: my K3 is here to stay - although I'm hearing good things about the high-end Flex radios. We'd have to sell quite a few sheep to pay for one though! I'm looking forward to info about your 160m antennas. I'm using an 80m loop which works nicely up high in the trees but is currently too low and a worm-warmer. I'm planning to put some more lines up to hoist it up, and hopefully get going on topband after a decade away. I'm thinking a simple dipole or inv-L to get me started, and act as a reference antenna. Hi Gary. Similar interests to you. Nice to work you last night. I wondered if the band would be open so late. Sounds like you have a great location. Mine is pretty good but on flat ground. Suitable hills are hard to find here. The KX3 is what it is. The K3/K3S is a great rig that I've had to opportunity to use a few times. Getting my 80m vertical/vertical array up is a priority once the wx improves. 160 improvements later in the year, I hope. 73 again.